Give your car a break! 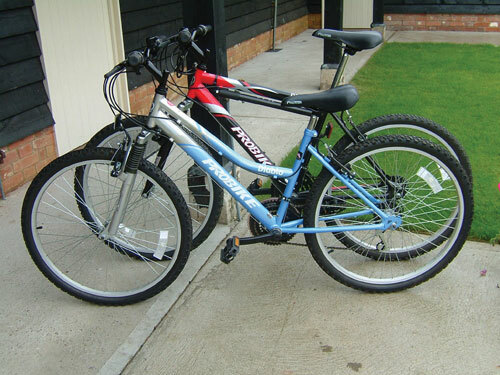 There are many things to do locally without your car and Palace Farm can provide you with bikes to get about. Kent is often called the garden of England because of the rich fertile soils and plenty of sunshine so ideal for fruit farms. A cycling holiday in the Kent Downs is a carefree two-wheeled adventures. Expect largely flat, big-sky landscapes, pick you own fruit orchards and tranquil country lanes. Kent is an exciting and beautiful area to cycle in, with both challenging rides through the Kent Downs Area of Outstanding Natural Beauty, and more leisurely rides along the coastal routes. Here at Palace Farm both types of ride are available close at hand, so bring your bikes or hire one of ours for a wonderful activity break. We love cycling and can give you advice on short and medium length rides locally and farther afield. Liz does like the coast so we know many traffic free or low traffic routes to get from Palace Farm to the Coast and we are finding more each month. Palace Farm Hostel and Campsite has a lockable bike shed so you can store your own bikes and a drying room for wet clothes. There are also facilities for washing down mountain bikes at the end of a muddy day. We have a selection of bikes we hire out at £10 per day. Helmets, high visibility vests, maps and routes and inspiration for your day out are all included. Contact Us for more details about cycle hire on the North Kent Downs Area of Outstanding Natural Beauty. Unfortunately we don't have children's bikes.